With Monday being the start of April, we again highlight how stellar the performance of the market has been on the first trading day of each month since the bull market began. Over the last four months, the S&P 500 has been up an average of 97 bps on the first day. Overall, the Index has had a cumulative return of 23.74% on the first trading day of the month while the rest of the month has returned 18.63%. 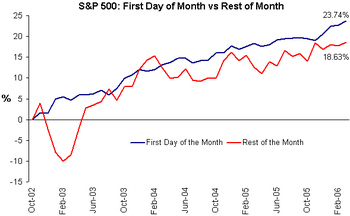 This means that the first trading day has accounted for more than 50% of the S&P's gains since October of 2002. Although some of the market's moves in the last few days seem dramatic, these moves are paltry when put in the perspective of the most extreme one day point moves in the Dow Jones. If these types of moves seem almost incomprehensible to you, it's probably because we haven't had a move of this magnitude in such a long time. 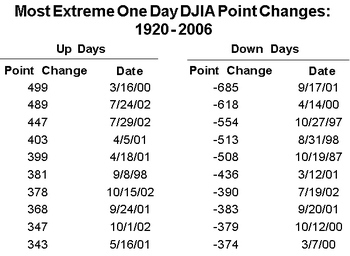 The last time the DJIA had an up or down day which qualified as a "top ten" point gain or decline was 870 trading days ago on 10/15/02. 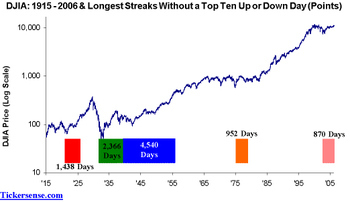 There are only four other periods where the DJIA went a longer stretch of time without what was at the time a top-ten up or down day in terms of points. 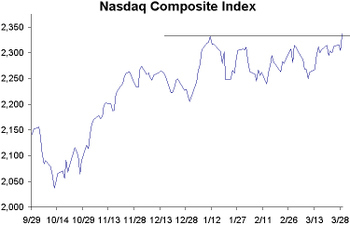 The Nasdaq Composite broke out today as shown by the chart below, so hopefully this will mean more upside. One of the consequences of an instant information world is that decisions must also be made instantly. When faced with an event, traders are forced to take action now and ask questions later. Often times however, the result is that instead of well thought out decisions, investors just make decisions. 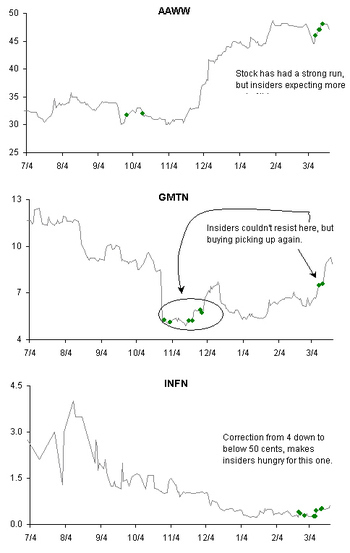 We have seen too many examples of a stock opening sharply lower, and then rallying throughout the day to finish higher. Instead of citing numerous examples of where this has occurred (and possibly reliving memories we’d possibly rather forget), we thought we would share an example of where we think this is occurring now. On Thursday 3/22, YRCW lowered guidance by a wide margin sending the stock down over 15%. In its news release, the company said that earnings would fall short of expectations due to lower shipping volumes,and not a loss of market share. Traders interpreted this data point as a sign the economy was falling off a cliff and sold off the stocks in the entire sector. When the dust settled, the transportation index registered a 2% decline on the day. We have several issues with extrapolating the negative news in YRCW to the whole sector for several reasons. First, YRCW is still feeling the effects of a poorly executed merger which has resulted in the stock falling over 35% while transportation stocks have risen over 20%. This hardly makes YRCW a good proxy for the economy or even the transportation sector. Secondly, one of YRCW’s two largest clients is WMT. 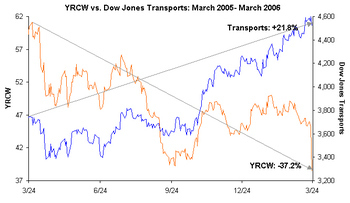 Therefore, traders immediately assumed that weak volumes at YRCW meant WMT was weak, and therefore the economy was weakening. What traders may have missed though was that earlier in the day on 3/22 (1 pm) WMT executives told analysts that the company was revamping its merchandising strategy and one of the initiatives it was pursuing was to reduce inventory levels to lower “clutter” on the shelves. So while many interpreted weakness at YRCW to mean weakness at WMT and therefore weakness in the economy, we think it is more likely that weakness at YRCW means weakness at YRCW and nothing more. Citigroup upgraded Phelps Dodge (PD) this morning from Sell to Hold. 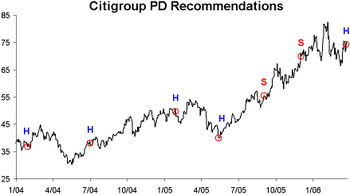 Before you go placing any orders however, make sure you check out the chart below highlighting Citi's prior recommendations on the stock. Bring an Umbrella Just in Case. Even though the market has been at or close to multi-year highs for the last several weeks, sentiment polls continued to show low levels of bullishness creating a benign backdrop for the market. In the last two weeks however, there have been some subtle shifts in the market environment. First, Investor’s Intelligence and AAII surveys appear to have bottomed. In the most recent week, both polls have shown decreases in bearish sentiment. The second shift concerns the market itself. 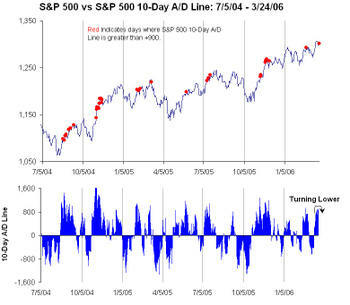 The 10-day S&P 500 advance decline peaked out on Thursday at 920. The chart below details each occurrence where this reading exceeded 900. 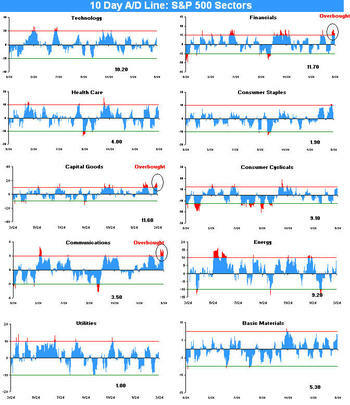 While high readings don’t necessarily portend an imminent decline, over the last year occurrences generally have at least been followed by periods of consolidation. We also run this analysis for subscribers on a daily basis. 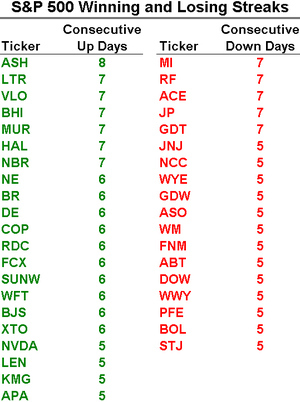 Currently, three sectors are at overbought levels (Capital Goods, Communications, and Financials). The final issue concerns the addition of GOOG to the S&P 500. Because of Google’s large market cap, it is going to be one of the fifty largest stocks in the S&P 500 and have twice the weighting of the stock it is replacing (BR). Therefore, index funds will have to reduce their weighting in the 499 remaining stocks in the index to make room for GOOG. This readjustment process will create a drag (albeit minor) on the index through this coming Friday. While each of the factors described above (rising bullishness, overbought market, and GOOG adjustment) are minor on their own, together they could present some storm clouds for the market in the coming week. 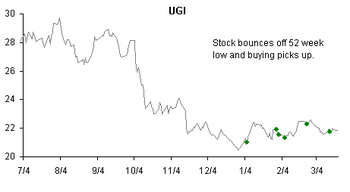 An intraday chart of GOOG from March 24 shows how it followed the typical pattern of a stock after Standard and Poor’s announces that it will be added to the S&P 500 index. 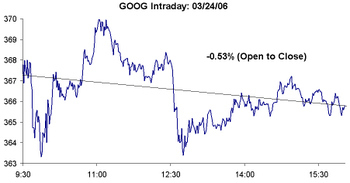 From yesterday’s open to close, GOOG traded down 0.53% vs. an average decline of 0.30%. 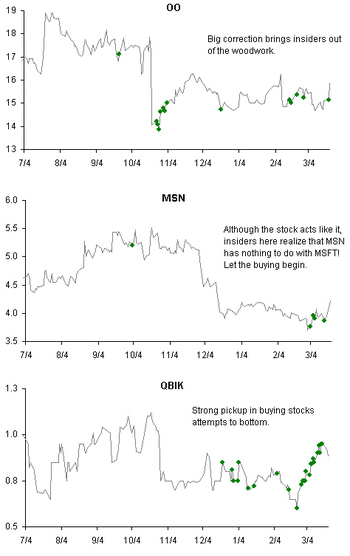 Since GOOG fit the average pattern so well, we decided to take the analysis one step further. We also examined how S&P 500 additions trade one and two weeks after the announcement is made that they will be added to the S&P 500. 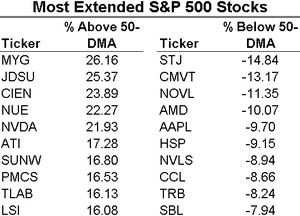 As the table below highlights, typically the stocks don’t do much at all. Chalk one up to the efficient market theory, as all the gains resulting from being added to the S&P 500 appear to be confined to the opening gap higher in the stock. With the announcement that GOOG will replace BR in the S&P 500, we examined the performance of recent additions to the index. 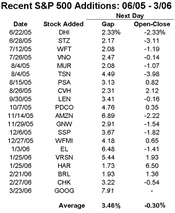 As the table details, all nineteen of the stocks added to the S&P 500 since June 2005 have gapped higher the morning after the release. 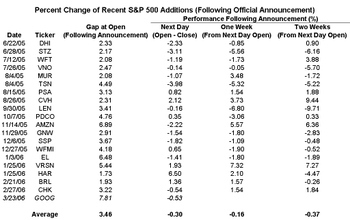 However, most of the gains occur in the initial gap higher. From open to close the average change is down 0.3% with 12 of the 19 issues declining. One of the takeaways from Fed Chairman Bernanke's speech on Monday night was that the economy will remain strong given that corporate bond spreads remain at relatively low levels and have not shown significant widening throughout the current rate tightening campaign. We would caution investors not to place too much emphasis on this indicator. The chart below, shows the historical levels of the spread between yields on 'Baa' rated corporate bonds and the yield on 10-year treasuries, with recessions noted by gray shading. In the six months prior to the last recession in 2001, spreads between corporates and treasuries rose by 50 bps. However, in the five previous recessions widening of corporate spreads appears to be more coincident with the onset of a recession than anticipatory. In three of the six recessions since 1962, corporate spreads actually declined in the six months preceding a recession. Coin flip anyone?